William Dean Howells, who wrote today's story for Victorian readers, was a most unlikely candidate to write a fantasy about what would happen if a child's wish for Christmas Every Day came true. I'll say more about him and why his works are important, but only after giving you this story. Today's tale was written as a story within a story. If you want that "story frame" also, go to http://public.wsu.edu/~campbelld/wdh/xmaseday.html, but for actually telling it I prefer to stick with just the story itself, so I removed the comments back and forth between the child and her father telling the story. I think it stands quite well on its own. While the presents may have changed, the idea behind what might happen if we had Christmas Every Day can be re-told even today. Once there was a little girl who liked Christmas so much that she wanted it to be Christmas every day in the year, and as soon as Thanksgiving was over she began to send postcards to the old Christmas Fairy to ask if she mightn't have it. But the old Fairy never answered, and after a while the little girl found out that the Fairy wouldn't notice anything but real letters sealed outside with a monogram -- or your initial, anyway. So, then, she began to send letters, and just the day before Christmas, she got a letter from the Fairy, saying she might have it Christmas every day for a year, and then they would see about having it longer. The little girl was excited already, preparing for the old-fashioned, once-a-year Christmas that was coming the next day. So she resolved to keep the Fairy's promise to herself and surprise everybody with it as it kept coming true, but then it slipped out of her mind altogether. She had a splendid Christmas. She went to bed early, so as to let Santa Claus fill the stockings, and in the morning she was up the first of anybody and found hers all lumpy with packages of candy, and oranges and grapes, and rubber balls, and all kinds of small presents. Then she waited until the rest of the family was up, and she burst into the library to look at the large presents laid out on the library table -- books, and boxes of stationery, and dolls, and little stoves, and dozens of handkerchiefs, and inkstands, and skates, and photograph frames, and boxes of watercolors, and dolls' houses -- and the big Christmas tree, lighted and standing in the middle. She had a splendid Christmas all day. She ate so much candy that she did not want any breakfast, and the whole forenoon the presents kept pouring in that had not been delivered the night before, and she went round giving the presents she had got for other people, and came home and ate turkey and cranberry for dinner, and plum pudding and nuts and raisins and oranges, and then went out and coasted, and came in with a stomachache crying, and her papa said he would see if his house was turned into that sort of fool's paradise another year, and they had a light supper, and pretty early everybody went to bed cross. The little girl slept very heavily and very late, but she was awakened at last by the other children dancing around her bed with their stockings full of presents in their hands. "Christmas! Christmas! Christmas!" they all shouted. "Nonsense! 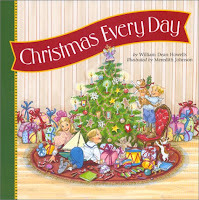 It was Christmas yesterday," said the little girl, rubbing her eyes sleepily. Her brothers and sisters just laughed. "We don't know about that. It's Christmas today, anyway. You come into the library and see." Then all at once it flashed on the little girl that the Fairy was keeping her promise, and her year of Christmases was beginning. She was dreadfully sleepy, but she sprang up and darted into the library. There it was again! Books, and boxes of stationary, and dolls, and so on. There was the Christmas tree blazing away, and the family picking out their presents, and her father looking perfectly puzzled, and her mother ready to cry. "I'm sure I don't see how I'm to dispose of all these things," said her mother, and her father said it seemed to him they had had something just like it the day before, but he supposed he must have dreamed it. This struck the little girl as the best kind of joke, and so she ate so much candy she didn't want any breakfast, and went round carrying presents, and had turkey and cranberry for dinner, and then went out and coasted, and came in with a stomachache crying. Now, the next day, it was the same thing over again, but everybody getting crosser, and at the end of a week's time so many people had lost their tempers that you could pick up lost tempers anywhere, they perfectly strewed the ground. Even when people tried to recover their tempers they usually got somebody else's, and it made the most dreadful mix. The little girl began to get frightened, keeping the secret all to herself, she wanted to tell her mother, but she didn't dare to, and she was ashamed to ask the Fairy to take back her gift, it seemed ungrateful and ill-bred. So it went on and on, and it was Christmas on St. Valentine's Day and Washington's Birthday, just the same as any day, and it didn't even skip the First of April, though everything was counterfeit that day, and that was some relief. After a while turkeys got to be awfully scarce, selling for about a thousand dollars apiece. They got to passing off almost anything for turkeys -- even half-grown hummingbirds. And cranberries -- well they asked a diamond apiece for cranberries. All the woods and orchards were cut down for Christmas trees. After a while they had to make Christmas trees out of rags, because people got so poor, buying presents for one another, that they couldn't get any new clothes, and they just wore their old ones to tatters. They got so poor that everybody had to go to the poorhouse, except the confectioners, and the storekeepers, and the book-sellers, and they all got so rich and proud that they would hardly wait upon a person when he came to buy. It was perfectly shameful! After it had gone on about three or four months, the little girl, whenever she came into the room in the morning and saw those great ugly, lumpy stockings dangling at the fireplace, and the disgusting presents around everywhere, used to sit down and burst out crying. In six months she was perfectly exhausted, she couldn't even cry anymore. And how it was on the Fourth of July! On the Fourth of July, the first boy in the United State woke up and found out his firecrackers and toy pistol and two-dollar collection of fireworks were nothing but sugar and candy painted up to look like fireworks. Before ten o'clock every boy in the United States discovered that his July Fourth things had turned into Christmas things and was so mad. The Fourth of July orations all turned into Christmas carols, and when anybody tried to read the Declaration of Independence, instead of saying, "When in the course of human events it becomes necessary," he was sure to sing, "God rest you merry gentlemen." It was perfectly awful. About the beginning of October the little girl took to sitting down on dolls wherever she found them -- she hated the sight of them so, and by Thanksgiving she just slammed her presents across the room. By that time people didn't carry presents around nicely anymore. They flung them over the fence or through the window, and, instead of taking great pains to write "For dear Papa," or "Mama" or "Brother" or "Sister," they used to write, "Take it, you horrid old thing!" and then go and bang it against the front door. Nearly everybody had built barns to hold their presents, but pretty soon the barns overflowed, and then they used to to let them lie out in the rain, or anywhere. Sometimes the police used to come and tell them to shovel their presents off the sidewalk or they would arrest them. Before Thanksgiving came it had leaked out who had caused all these Christmases. The little girl had suffered so much that she had talked about it in her sleep, and after that hardly anybody would play with her, because if it had not been for her greediness it wouldn't have happened. And now, when it came Thanksgiving and she wanted them to go to church, and have turkey, and show their gratitude, they said that all the turkeys had been eaten for her old Christmas dinners and if she would stop the Christmases they would see about the gratitude. And the very next day the little girl began sending letters to the Christmas Fairy, and then telegrams, to stop it. But it didn't do any good, and then she got to calling at the Fairy's house, but the girl that came to the door always said, "Not at home," or "Engaged," or something like that, and so it went on till it came to the old once-a-year Christmas Eve. The little girl fell asleep, and when she woke up in the morning -- it wasn't Christmas at last, and wasn't going to be, anymore. The little girl went to thank the old Fairy because she had stopped its being Christmas, and she said she hoped the Fairy would keep her promise and see that Christmas never, never came again. Then the Fairy frowned, and said that now the little girl was behaving just as greedily as ever, and she'd better look out. This made the little girl think it all over carefully again, and she said she would be willing to have it Christmas about once in a thousand years, and then she said a hundred, and then she said ten, and at last she got down to one. Then the Fairy said that was the good old way that had pleased people ever since Christmas began, and she was agreed. Then the little girl said, "What're your shoes made of?" And the Fairy said, "Leather." And the little girl said, "Bargain's done forever," and skipped off, and hippity-hopped the whole way home, she was so glad. Now about why I called William Dean Howells "a most unlikely candidate to write (today's) fantasy." Google his name and you will find this author of seventy books described as: an American realist author, literary critic, and playwright. Nicknamed "The Dean of American Letters", he was particularly known for his tenure as editor of the Atlantic Monthly; The most influential American novelist, editor, and critic of his generation; a champion of French and Russian realistic writers and a brilliant advocate of the most controversial American writers of his own time; career spanned a period of radical change in American literature; as novelist, critic, and editor, he contributed greatly to those changes. That's just the first page! Students are usually unfamiliar with Howells and his central position in nineteenth-century American literature. If they have heard of him at all, they are likely to have picked up the (still) prevailing stereotype: that Howells was a genteel prude whose realism could not possibly be of any interest to contemporary readers. Another problem is that students are not often sensitive to quiet irony in what they read; they are not prepared to hear the subtle nuances in Howells's narrative voice--or to read between the lines in his treatment of sexuality, which he handled with Victorian decorum but did not avoid as a subject. Howells was acutely aware of the female dominance of the audience for fiction in the period. He clearly imagined that he was writing for women primarily and believed further that he had a moral responsibility not to offend the sensibilities of young women readers. Insofar as the current audience for literature has been "masculinized" by modernism, Howells's work may sound out of key in the same way that much women's fiction from the period does. In this sense, Howells is best understood as a "woman's" writer. My own resources on Howells have been limited to the internet. None of his many online biographies explain it: http://public.wsu.edu/~campbelld/howells/hbio.html; http://www.online-literature.com/william-dean-howells/; http://www.bartleby.com/187/9.html; http://college.cengage.com/english/lauter/heath/4e/students/author_pages/late_nineteenth/howells_wi.html; http://www.encyclopedia.com/topic/William_Dean_Howells.aspx; not even the Howells Society! I wish the schedule for this blog, unlike when putting together a program, would allow me to borrow and check the books about him. 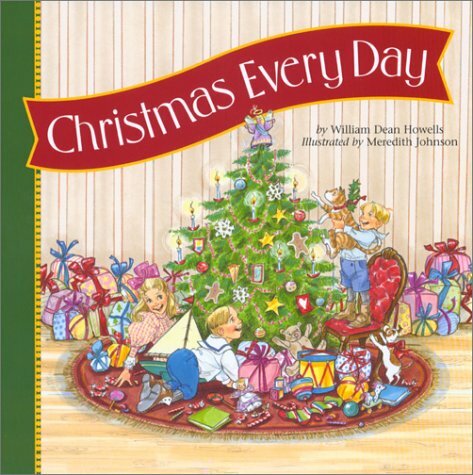 In wondering how he came to write it, I noticed he wrote it in 1892 as the title story for Christmas Every Day and Other Stories Told for Children and by then his youngest of three children was already twenty -- possibly written for grandchildren? Howells was definitely prolific and this story, unlike his most famous novel, The Rise of Silas Lapham, seems at odds with the man "known to be the father of American realism, and a denouncer of the sentimental novel." Whatever his inspiration, the story is deservedly well-known. Whether told as he wrote it or if you chose to modernize it, it still has a sly lesson looking at holiday excess. If you want a picture book version of the story, Meredith Johnson created one. I have always liked this story and tell it occasionally. Thanks for the extra background information, Lois. My pleasure, Marilyn. Won't even say "Take it, you hateful thing!" as in the story.